The theory is straightforward. Sarrazin and co say that braneworld theories predict that particles such as neutrons can exist in our brane and another at the same time, in a superposition of states. When these neutrons are disturbed by, say, a collision with a nuclei, the superposition is destroyed and the neutron ends up with a certain probability in one brane or the other. 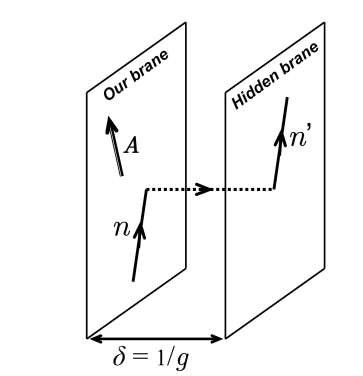 This is the process that allows neutrons to leak in and out of branes. An important goal of their experiment is to distinguish neutrons that have leaked into our universe from another brane from those that exist naturally in our universe. So much of Sarrazin and co’s work is determining how this can be done. 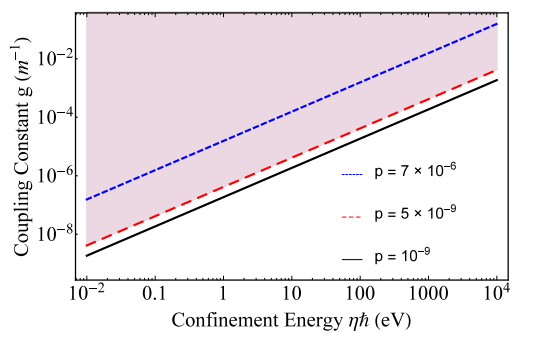 The conventional behaviour of neutrons is well understood. Physicists can calculate and measure the number of neutrons a nuclear reactor produces. Indeed, nuclear reactors are carefully shielded to stop these escapees. So the number of neutrons even relatively close to a shielded reactor should be small. But in addition to neutrons produced inside the reactor, there is always a background level of neutrons produced by cosmic ray collisions. Sarrazin and co say they can distinguish these neutrons from the interlopers in three ways. To start with, their detector will be heavily shielded so neutrons cannot enter it from the outside. So any that are detected must have been created inside the detector. Nevertheless, it may still be possible for cosmic rays to enter the detector and generate neutrons inside. However, Sarrazin and co say the number of neutrons generated in this way will be constant and not depend on the position of the detector. By contrast, the number of neutrons that leak back into our universe from another brane will depend on the distance of the detector from the reactor, where they are created in the first place. This rate should fall with the square of the distance from the reactor. So any distance dependence will be good evidence of brane leakage. Finally, the neutrons should interact with the Earth’s gravitational field. This interaction will cause the superposition collapse that allows the neutron to leap into another brane. So any change in this gravitational field should influence the rate at which the neutrons leak in and out of our brane. It turns out that the Earth’s elliptical orbit around the Sun causes just such an annual change in the gravitational field of about 2 per cent. And this ought to cause an annual modulation of the neutrons flux in the experiment. Sarrazin and co have identified a suitable location for their experiment. They want to place their detector a few metres from a reactor at the Institute Laue Langevin in Grenoble, one of the world’s leading neutron science research centres. When such an experiment might start, they do not say, however. That’s an interesting proposal that is well within the reach of current neutron detector technology. It would not be the first attempt to look for stuff leaking into our brane, however. Another idea is that photons might also leap from one brane to another and back again, a process that might allow them to bypass conventional barriers such as opaque walls. Physicists have already begun to look for evidence of this by shining a powerful laser beam at an opaque wall and using a detector on the other side to see if any pass through. These experiments have not yet found any positive evidence but even a null result is interesting because it places constraints on how strongly our brane can be coupled to other. This entry was posted in COSMOLOGY, High Energy Physics, NUCLEAR PHYSICS. Bookmark the permalink.